What Steps Should I Take to Get Started Opening an Ice Cream Parlor? There are three actions I’d recommend to anyone interested in getting started in the ice cream business. 1.) 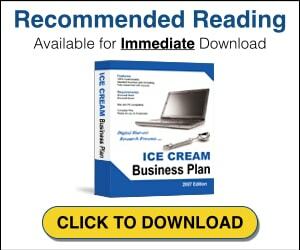 Read everything you can get your hands on about the ice cream business and running an ice cream parlor. 2.) The next step would be to get in touch with anyone you can about getting started in the ice cream business. Ask people what they like and dislike about the business. Posting in this forum is also a great way to get your questions answered. 3.) Spend two weeks to a month in an ice cream shop working for someone else. You’ll do better here if you contact people outside the area you are considering starting your shop. Try and find one that you feel is the most successful so you learn the right habits. I hope these tips help. If you have more specific questions please feel free to email me or post them.